Noelle Kerlin is wary of food like some 2 ½ year olds are fearful of strangers, the dark or growling dogs—every bite has the potential for harm. She’s learned at a very young age that food can be her enemy. The tiny blonde with a headful of curls is allergic to more than 30 foods—all milk options (cow, soy, almond), wheat, rice, oats, corn, chicken, bananas, pineapple, watermelon, peaches, cheese, eggs, etc. Potatoes are the only carbohydrate she can eat. 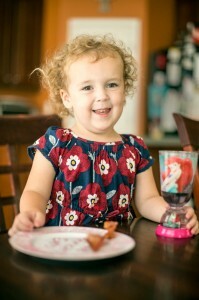 Noelle’s reactions to allergens are varied—she’s broken out in quarter-sized hives, and foods have made her throat itch and her eyes red-rimmed. She vomits, has diarrhea, and because of the diarrhea, has severe diaper rashes. Since her diet is so limited she drinks 24 ounces a day of an elemental formula for children with milk allergies that supplies all of her nutrients. Noelle Kerlin. Photo by Daniel Dubois. 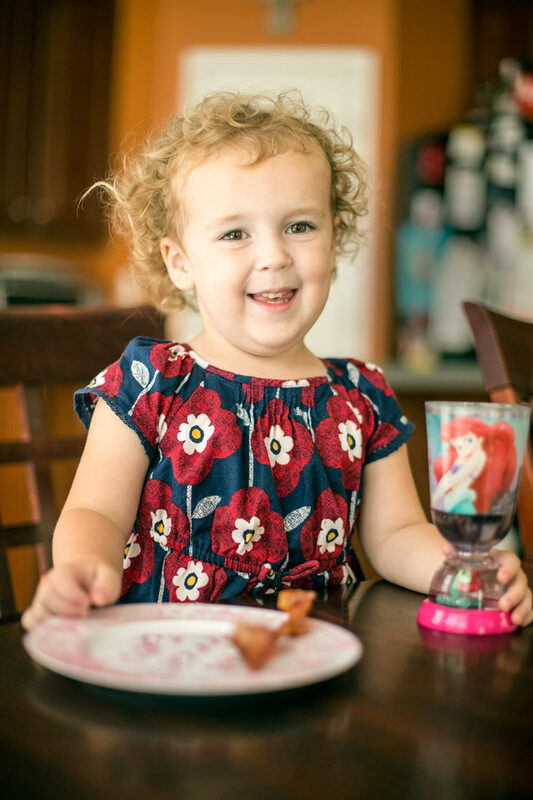 Because of her allergies, she has been diagnosed with eosinophilic esophagitis, when a type of white blood cell builds up in the esophagus as a reaction to foods, allergens or acid reflux. It will require lifelong management. Luckily her reactions have not included anaphylaxis, a severe, potentially life-threatening allergic reaction that can occur within seconds or minutes of exposure to allergens. Anaphylaxis results in lowered blood pressure and dilated blood vessels. In severe cases a person can go into shock and it can be fatal. Many people who have severe allergies keep an autoinjector (EpiPen ®) on hand to deliver a measured dose of epinephrine (also known as adrenaline) in case of anaphylaxis. The Kerlins, who have two other children without food allergies, have learned where they can go to eat out. Chick Fil-A French fries are cooked separately from chicken, so they’re safe, and some local chefs will prepare food safely for Noelle. A food allergy is an abnormal response to a food, triggered by the body’s immune system. The immune system responds to the food as if it were a threat. Called the “Super 8,” the most common allergenic foods are: milk, eggs, peanuts, tree nuts (such as almonds, cashews, walnuts), fish (such as bass, cod, flounder), shellfish (such as crab, lobster, shrimp), soy and wheat. They account for an estimated 90 percent of food allergic reactions. According to Food Allergy Research and Education (FARE), about 1.5 million Americans have food allergies. They affect 1 in every 13 children under 18 in the U. S.—or about two in every classroom. Experts differ on whether there is strong evidence that food allergies are increasing. “We just don’t know. We believe the problem is increasing, but we just aren’t sure,” he said. Many believe that hygiene, or extreme cleanliness, might be partly to blame for allergies in industrialized nations, Plaut said. The “hygiene hypothesis” states that excessive cleanliness in our anti-bacterial society interrupts the normal development of the immune system, and this change leads to an increase in allergies. In other words, a very clean lifestyle has eliminated many of the types and quantity of germs the immune system needs to develop into a less allergic system. But there’s also a theory that other environmental factors, like pollution and added chemicals in our diet, are involved. Stacy Dorris, M.D. Photo by Daniel Dubois. But Dorris said it’s important to keep food allergy occurrence rates in perspective. According to a FARE-funded study, only about 1 percent of all young children in the U.S. have a peanut allergy, one of the most common and life-threatening food allergies. • Peanut and tree nut allergies, which tend to develop in childhood, are usually lifelong. • Cow’s milk, egg and soy allergies typically begin in childhood and eventually may be outgrown. However, in the past, most children outgrew these allergies by school age. A recent study, conducted by researchers at Johns Hopkins University School of Medicine, indicated that children are taking longer to outgrow milk and egg allergies. Fortunately, the majority are allergy-free by age 16. • Fish and shellfish allergies also tend to be lifelong. More than 6.5 million adults are allergic to finned fish and shellfish. • Children with multiple food allergies outgrow their allergies less frequently, and these children often have associated severe eczema, asthma and rhinitis. Food allergies can develop out of the blue at any time in life because the immune system is “incredibly dynamic and constantly in motion,” Dorris said. The severity also varies, Dorris points out. One child may break out in hives, when another can experience the life-threatening anaphylaxis. Dorris also has personal experience with food allergies—her 4-year-old daughter, Andie, has been allergic to peanuts since she was 1. About a year ago, Andie went to work with her father on a snow day and took a bite of a protein bar containing peanuts that she pulled out her father’s assistant’s drawer. Nine-year-old Christopher Clauss of Columbia, Tennessee, was diagnosed with an allergy to peanuts, tree nuts and eggs when he was about 1. “But we avoid all nuts,” said Eric Clauss, Christopher’s father, a paramedic and nurse, who along with Christopher’s older sister, has food allergies. “It’s what you don’t know that’s scary, and sometimes you just don’t know,” he said, adding that the family looks at all foods as potential allergens. Christopher Clauss. Photo by Daniel Dubois. When he was 4 Christopher ate cheese, which he had safely eaten before. He quickly developed an all-over body rash. “Our routine was to give him Benadryl, but his reaction continued,” Eric said. Eric stuck Christopher with an EpiPen, and his condition rapidly improved within a minute or so, then he drove him to Vanderbilt, about an hour away. In hindsight, that wasn’t a good idea, Eric said. The dose of epinephrine may wear off fairly quickly and severely allergic patients can need a second dose. Luckily, Christopher did not. At the Pediatric Emergency Department at Monroe Carell Jr. Children’s Hospital at Vanderbilt Christopher was given steroids by IV and monitored for six hours. Two years later he was back with another severe reaction. Eric has instructed Christopher’s teachers about how to administer the EpiPen. Last year, the Tennessee State Legislature passed a bill requiring public and private schools to have at least two EpiPens on hand to treat students in the event of a severe allergic reaction. There’s a ritual when Christopher eats a new food. He takes a tiny bite of food and waits about five minutes to see if he has a reaction. Usually his mouth “feels funny” or his stomach hurts if he’s allergic. If he starts to react, he doesn’t eat any more, and he brushes his teeth to get rid of food particles. 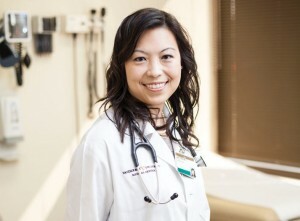 Jane Choi, M.D. Photo by Susan Urmy. Jane Choi, M.D., a Vanderbilt adult allergist, said the number of patients with food allergies in her practice has increased. 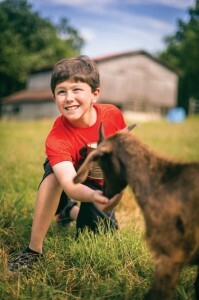 They are seeing new types of allergies—a red meat allergy brought on by a tick bite (see sidebar) and also exercise-induced food allergies. Choi recommends that her allergy patients carry two EpiPens with them at all times in case a severe reaction requires an additional dose, or if the first one misfires. Patients with suspected food allergies are asked to keep a food diary and event log to help the allergist narrow down what might be causing an allergic reaction. “In addition to being a physician, you also have to be a detective,” said Choi, who had an anaphylactic reaction to cashews when she was an allergy fellow at Johns Hopkins. Although she had eaten cashews before, she ate more than usual between seeing patients. She collapsed while examining a patient. 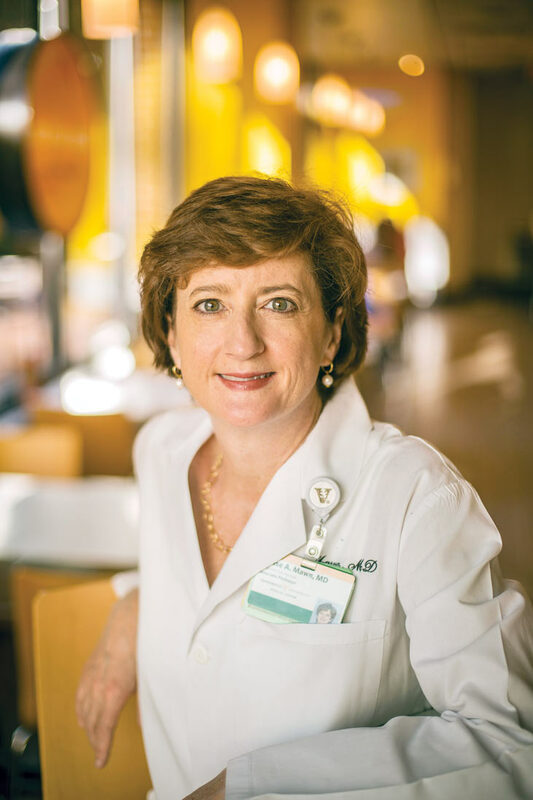 Louise Mawn, M.D., a busy Vanderbilt eye surgeon and the mother of four children, ages 8 – 14, credits her Vanderbilt primary care physician Jan Price, M.D., with sifting through Mawn’s debilitating symptoms and suspecting a food allergy. In 2012, Mawn was convinced she had a serious illness because of the severity of her symptoms. “I had a whole cornucopia of symptoms,” she recalls, including a lump in her throat, extreme fatigue, swelling of her face and eyelids and stomach upset. Louise Mawn, M.D., had debilitating symptoms and feared she had a serious illness. Thanks to the diligence of her physician, they discovered she is allergic to food preservatives. Photo by Daniel Dubois. The lump in her throat ended up being the base of her swollen tongue. It was all she could do to show up early in the morning for work and stay awake until early evening when her family was fed. 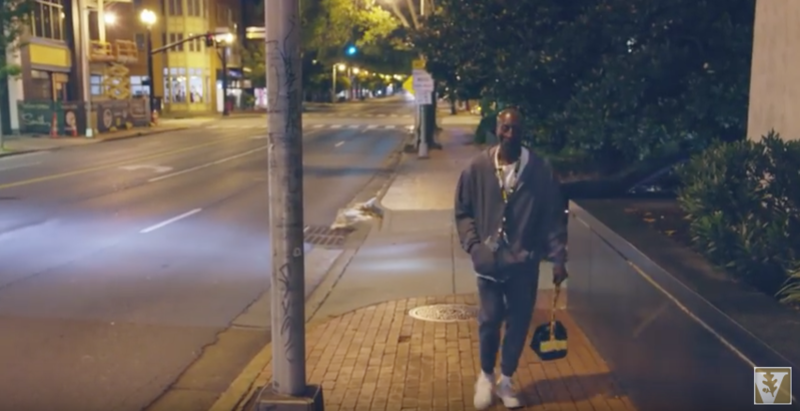 Price sent her to a rheumatologist and a gastroenterologist to rule out other illnesses, with visits to the Vanderbilt Allergy, Sinus and Allergy Program (ASAP) sprinkled in between. 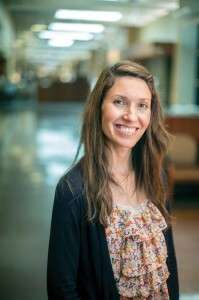 With the help of Adam Cates, a nurse practitioner at ASAP, her allergens were narrowed down and she was finally diagnosed with an allergy to food preservatives, like sulfites and nitrites. The diagnosis came after a frightening trip to an out-of-town medical conference where she was convinced she was going to lose her airway. The diagnosis resulted in a huge lifestyle change for Mawn, particularly because the family’s normal diet consisted of many processed and fast foods that she could get on the table quickly. “The microwave was the most critical appliance in my kitchen,” she said. Mawn’s husband and children now help prepare healthy, preservative-free meals. “We prefer to eat at home. It’s easier and it’s safer,” she said, adding that she doesn’t bemoan her diagnosis. Mawn is grateful for Price’s careful “Nancy Drew-like meticulous investigation” into her symptoms. “When she suggested I might have a food allergy, I laughed. I felt like I was humoring her by going to the allergy appointment. I said ‘at the age of 48 I have a food allergy? NIAID’s Plaut said one of the most promising NIH-funded research projects focuses on whether the timing of when foods are introduced to infants makes a difference in the development of an allergy. “The popular theory has been that you avoid an allergy by avoiding the food, when, in fact, it may be the exact opposite of what we should do,” he said. The NIH-funded LEAP study (Learning Early about Peanut Allergy) took place in London, where the standard of care, like that in the United States, has been to avoid peanuts in early childhood. Recently the standard of care in the U.S. has changed so there is no recommendation for either avoiding or eating peanuts because it’s unclear that avoiding them is helpful. The LEAP clinical research study aims to determine the best strategy for preventing peanut allergy in young children since the majority of children have their first reaction to peanuts between 14 and 24 months of age. Children suffering from eczema or who are allergic to eggs are the highest risk. The LEAP study looked at 640 children who were enrolled in the study when they were between 4 months and 10 months of age. The children were randomized into two groups—one that avoided peanut-containing foods until age 5, and another that received an age-appropriate peanut snack at least three times a week beginning when they entered the study. 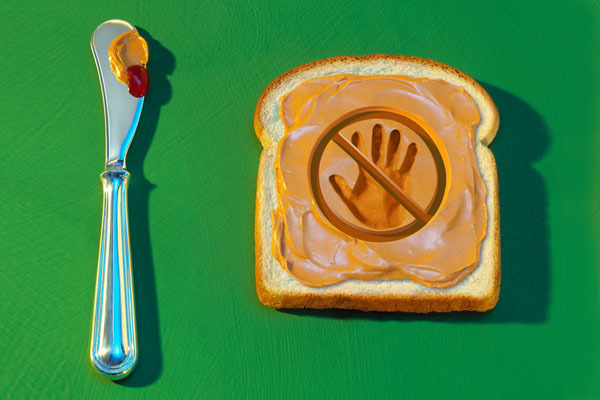 The study, which ended in late May, monitored children until age 5 to see which method—avoidance or consumption—works best for preventing peanut allergy. The results will soon be available. Other research is aimed at treatment, since there is currently no effective therapy for food allergies beyond food allergen avoidance and rapid medical treatment for allergic reactions to accidental exposures. One NIH-funded research study is looking at oral immunotherapy (OIT) in which patients with food allergies are fed small incremental amounts of that food. They are built up over the course of several months to a maintenance dose and then therapy is continued at home. The goal is to desensitize the patient so that the food doesn’t cause an allergic reaction anymore. 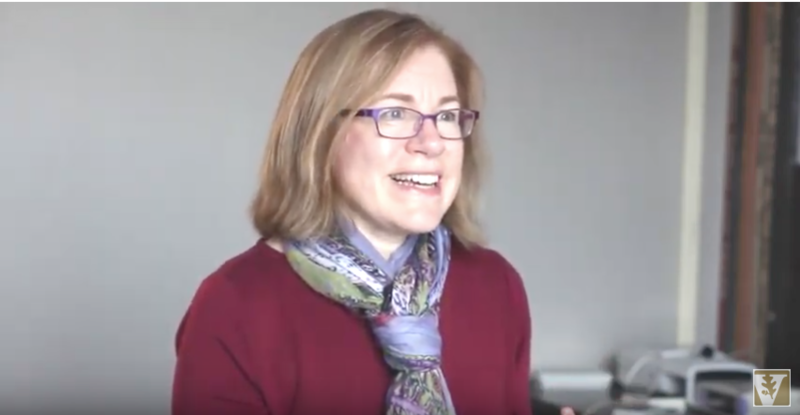 There are three types of allergen-specific immunotherapy that are currently being investigated in NIH-funded studies in the United States: oral, sublingual (under tongue), and epicutaneous (patch) immunotherapy. These therapies are in various stages of clinical investigation.